Honokohau Bay is 5 miles south of Kona Airport. From the Honokohau Harbor entrance go .9 miles south (left). Park & walk 200 yards over the lava to the sandy beach/small cove. You are here. Snorkel south & back. LOOKOUT! Boats can slice yo coconut! 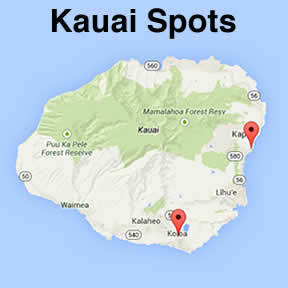 Drive to the north side of the harbor to Honokohau/Kaloko National Historical Park. Walk along the harbor edge or marked trail to an ancient Hawaiian Fishpond for a swim or snorkel—good for young kids and beginners. Kekaha Kai State Park is sand, lava & coral. The 1st entrance is a few miles north of the airport on Hwy 19, across a rough lava field road to a great picnic & snorkel spot. Juveniles may BOOGIE here too. The 2nd entrance farther north (by Veterans’ Cemetery) goes to Kua Bay, a beautiful white-sand beach good for swim & boogie. Early AM is less wind (usually). Park closes at 4 PM. Closed Wednesday for maintenance. 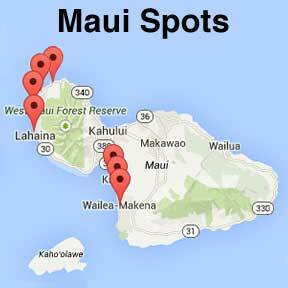 Anaeho’omalu Bay (Waikoloa Beach Park) is 24.1 miles north on Hwy 19. Turn left at Waikoloa Beach Drive & go .6 mile to the STOP sign. Go left .3 mile & park. Snorkel anywhere; the barrier reef protects. Makaiwa Bay (Mauna Lani Bay Hotel) is north of Waikoloa Beach Resort on Hwy 19. Turn onto Mauna Lani Drive, go straight at the round-about (Snorkel Bob’s Mauna Lani is on the right in The Shops @ Mauna Lani); Go left on Pauoa Rd. about .01mi., then right into a small parking lot. Follow the paved trail past the restrooms to the ocean. Go left. Past the Kalahuipua’a Fishponds is a sandy beach (the Beach Club) with EZ access to showers and ocean. Good for beginner and advanced snorkelers. Hapuna State Park is a vast, white-sand beach 7 miles north of Waikoloa on Hwy 19. Go left at the Hapuna sign, go .4 mi. & park. Great beach with fair snorkeling & good boogie waves, but BIG SURF IN WINTER!#$%^)(?! Wai’alea Bay inside Hapuna Beach State Park, just south of the parking lot on Old Puako Road; shade, a sandy beach & excellent reef. Good for beginner and advanced snorkelers. White Sands Beach Park a.k.a. Disappearing Sands or Magic Sands is 3 miles south of Snorkel Bob´s on Alii Drive. Danger! Big Surf! Beach sand comes & goes (disappearing) with varying seasonal wave action. CAUTION! Rocks & surf can be dangerous. But Magic Sands Beach has great boogie waves just south of Laaloa Cover. Snorkel ingress & egress is here too. Coral arches & caves. Beware sea urchins. Kahalu’u Beach Park is dying from humans. The U. of H. Sea Grant Dept asked every snorkel shop in to let this place heal. We at Snorkel Bob’s comply. Avoid Kahaluu. If you must go, don’t walk on or touch coral. Give reefs a chance. Kealakekua Bay (Marine Preserve) is a pristine reef & the site of Captain Cook’s Monument. The bay is accessed by guided tour only. 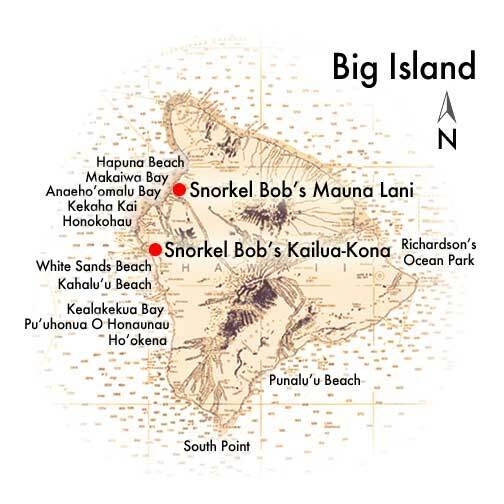 Ask one of my, Snorkel Bob’s, snorkel consultants to arrange your trip to Kealakekua. Pu’uhonua O Honaunau National Historic Park (Place of Refuge a.k.a. Two Steps) Drive south of Kailua-Kona about 20 miles on Hwy. 11. About 5 miles past the road to Kealekekua, turn right on Hwy 160 (Look for Pu’uhonua O Honaunau sign). At the bottom of 160, go left into the National Park. DO NOT ENTER THE PARK–– take the one-way sign to the right before the gate. Two Steps is a short walk across smooth lava. Ho’okena Beach Park (swim & boogie in summer, snorkel in winter). About 25-30 mi. south on Hwy 11. Pass Hwy 160, Pu’u O Honaunau National Historic. Park. After small store on left, go right to beach park. At the end of road, turn left to beach parking. Your fellow snorkelers on the great snorkel byway know many more spots. Always ask about the parking, surf, surge, current, viz, & safety. Richardson’s Ocean Park is a county park. A seawall follows much of the rocky shoreline. Good for swim, dive, surf and picnicking. Lifeguards, picnic areas, showers, restrooms, parking, telephones, & ponds. Hazardous waves, current and footing. Best to snorkel right of parking lot. Enter via sandy patch. Most marine life by rocks or in tide pools. Turtles! 7 A.M. to 7 P.M.